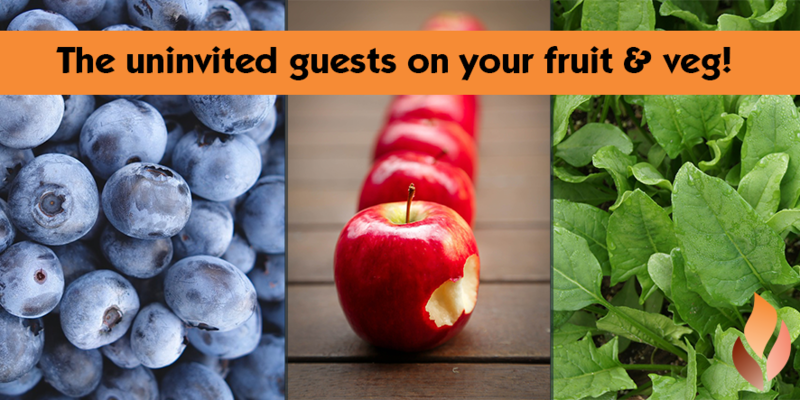 Home » Events and Blogs » Blog » The uninvited guests on your fruit and veg! The uninvited guests on your fruit and veg! We all know that eating fresh fruits and vegetables is one of the keys to a healthy body and a healthy mind. But unfortunately, it’s not as simple as it sounds. Our fresh fruits and vegetables are crawling with pesticides – pesticides that are harmful to your health. This can include neurotoxicity, disruption of the endocrine system, carcinogenicity and immune system suppression. This is why eating fresh, ORGANIC produce is the way to go! Eating fresh organic produce is a delicious and nutritious choice for you and your family. However, the reality is that organic produce can be expensive! We do what we can, but sometimes it all seems a bit hard. When purchasing certified organic you can have peace of mind that these farmers have used natural methods to grow their produce – from the soil, through the growing process, to the final food. This is unlike traditional farmers who apply insecticides and herbicides to rid their produce of insects, diseases and weeds. Have we put you off your fruit and veg? Don’t stress it! Thankfully, the Environmental Working Group (EWG) have created two lists: the “Dirty Dozen” and the “Clean Fifteen” (which we recommend saving, memorising or printing off!). Introducing the “Dirty Dozen”. The most commonly and highly contaminated foods with pesticides and chemicals, even after washing and peeling! The chemical pesticides detected in these studies are known to cause cancer, birth defects, nervous system and brain damage and developmental problems in children! An analysis done by the EWG estimated that by avoiding the foods on the “Dirty Dozen” list, consumers could reduce their exposure to pesticides by almost 90%. 90%!!! Without further ado, here’s the “Dirty Dozen” – the foods to AVOID UNLESS THEY ARE ORGANIC! Remember to always look for organic, particularly for these foods that are absolutely worth those extra few dollars to buy organic! If you can’t find organic, your next best option is to scout out ‘pesticide’ or ‘spray’ FREE! Eat fresh, but be mindful of what produce you’re REALLY buying and the impact it can have on your body! If you have a green thumb, consider growing your own delicious, organic produce!